The landings began on January 22, 1944. Although resistance had been expected, as seen at Salerno during 1943, the initial landings were essentially unopposed, with the exception of desultory Luftwaffe strafing runs. By midnight, 36,000 soldiers and 3,200 vehicles had landed on the beaches. Thirteen Allied troops were killed, and 97 wounded; about 200 Germans had been taken as POWs. 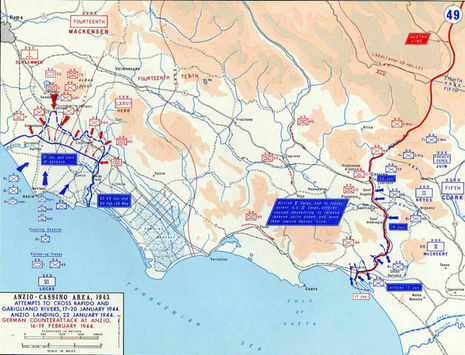 The 1st Division penetrated 2 miles (3 km) inland, the Rangers captured Anzio's port, the 509th PIB captured Nettuno, and the 3rd Division penetrated 3 miles (5 km) inland. In the first days of operations, the command of the Italian resistance movement had a meeting with the Allied General Headquarters: it offered to guide the Allied Force in the Alban Hills territory, but the Allied Command refused the proposal. On January 22, 1944, two days before the 100th made its first assault on Monte Cassino, the U.S. 5th Army landed at Anzio, a beach-head south of Rome. The goal was to relieve the pressure at Monte Cassino by placing 50,000 Allied soldiers north of the Gustav line. After the 100th Infantry Battalion's last assault on Monte Cassino, the unit was pulled back into the mountains to recuperate. A month later on March 15th a second wave of bombers, greater than the first, rained tons of bombs on the mountain. The Germans held stubbornly through attacks by 5 Allied Divisions. Not until May 17th did Monte Cassino fall. Meanwhile, the 100th Infantry found itself stalemated with the other Allied soldiers near the beaches of Anzio.